New waterproof RJ45 Cat 6 Cable Plug which is sealed to IP67 standard when mated with the matching panel coupler. This robust product features locking collar which screws on to the threaded matching panel connector and is moulded from Thermoplastic.Easy to follow assembly instructions are supplied with the plug.Applications include medical, outside broadcast,field instrumentation and data collection.This product is suitable where reliable connection in harsh environments is required. 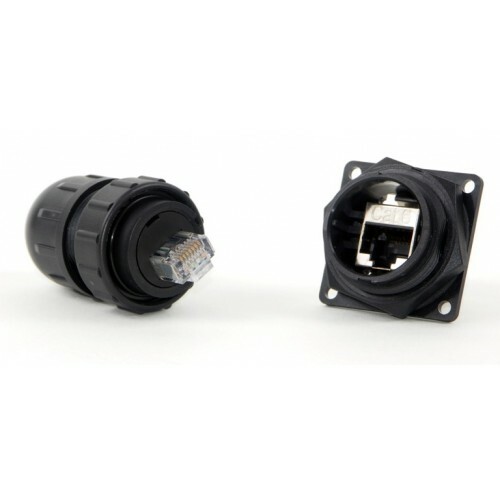 This product features an screened RJ45 connector, please see below for unscreened version along with part numbers for the matching panel connector. Unscreened RJ45 cable plug , Part No:DCC-RJ6T Matching panel socket with unscreened RJ45 thru socket:Part No: DCP-RJ6-TF Matching panel socket with screened RJ45 thru socket:Part No: DCP-RJ6-S-TF Other varients of the panel socket are available, including IDC type termination.